That Tottenham were placed in the same group as Internazionale in this season’s Champions League might seem more than just a mere coincidence. While the London club seem far ahead of the once-mighty Italians today, the roles were reversed back in 2010. Tottenham were making their Champions League debut, in the early stages of their progression into England’s elite, and this was their nascent period, a time of unknown. They might have fancied their chances against Twente and Werder Bremen, while hoping more than expecting to hold their own against Internazionale as well. And yet they were cruelly exposed inside 35 minutes in the Giuseppe Meazza, conceding four to Javier Zanetti, Samuel Eto’o (twice) and Dejan Stanković. It was a brutal dissection of Tottenham’s frailties and their lack of pedigree at the biggest stage, their status as the entertaining yet inexperienced newcomers thrown into light. Harry Redknapp’s side were naive but also refreshing, a combination that can see off lesser teams with ease but might be caught out at a bigger stage. But if the plan was to simply avoid embarrassment from that point on, Spurs had a superhero of their own. Gareth Bale was a fresh-faced superstar in the making, having made the conversion from left-back to left-winger. But he was still an unknown quantity on the global stage, having moved from Southampton to Tottenham. He chose that particular Tuesday evening to burst into prominence with unabashed exuberance and rise above the self-doubt permeating across a deflated dressing room, realising that it was up to him to make a difference. And what a difference that was. From 4-0 down at half-time, Bale single-handedly reduced the arrears to 4-3 with a most glorious hat-trick. The impact of his goals made it seem as though they had won the game. It is all the more astounding when you consider Redknapp and Tim Sherwood were contemplating taking off Bale and shutting shop in a bid for damage limitation. With an eye on the Premier League, it would have been a justified choice, if an acceptance of their status. Tottenham were limited early on from Heurelho Gomes’ red for a tackle on Jonathan Biabiany. Having sacrificed Luka Modrić for Carlo Cudicini, it is no surprise that the man-light newcomers would be torn apart. Bale managed to divert all potential headlines away from Gomes, Eto’o and Inter’s dominance towards himself. It was the evening ‘Balemania’ burst into life, a catalyst for what was to come. Having joined Tottenham as a gangly 17-year old, they were expectations aplenty placed upon his young shoulders and they certainly weighed him down in his early years. There was inconsistent form and injury problems, but there was also the albatross of Tottenham’s failure to win 24 league games with him in the side. There were rumours of moves to Birmingham and Nottingham Forest, too. If there were lingering doubts about his ability, they were vanquished after that night in Milan. His goals were all well-taken, blazing past Zanetti and Maicon and nestling the ball well past Júlio César’s grasp. The first had a degree of aesthetic to it, the ball bouncing in off the post after a scintillating run. His second was much more ruthless, dispatched to the same corner. And his third, well, a ruthless strike with his wand of a left foot, guided away to spark hopes of an improbable equalizer. His last two goals were scored in the 90th and 91st minute, leaving viewers awestruck. Bale had a hat-trick against Inter, aged just 21. The momentum had swung firmly into Tottenham’s court. 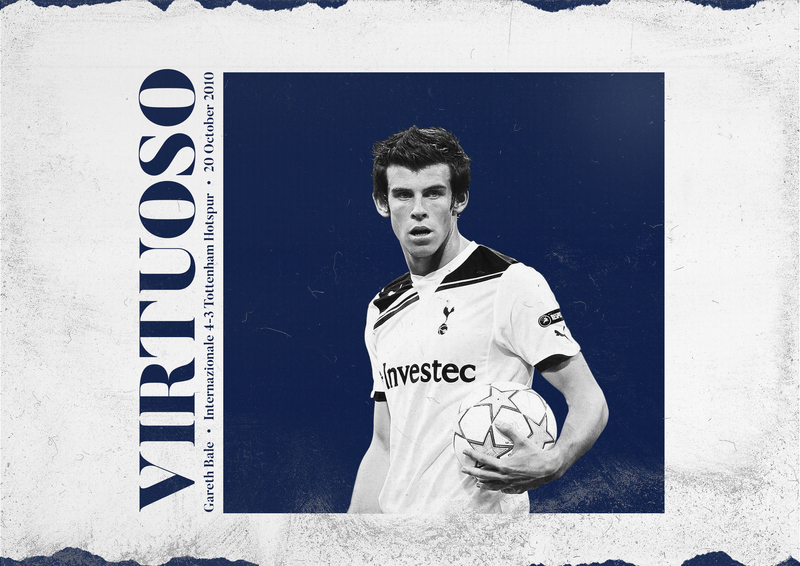 When Inter found themselves at White Hart Lane weeks later, they were met by a fearless Spurs. Rafael van der Vaart put them ahead after 18 minutes, but this was a continuation of the Bale show. He slalomed down the left flank repeatedly, leaving Maicon floundering and trailing in his blaze. “Taxi for Maicon!” was the roaring cry from the home crowd. The Brazilian was regarded as one of the best right-backs in the world, but he had no answer to the young Welshman – and has not been the same since. He stormed forward with pace and dexterity, and Inter were always on the backfoot. Peter Crouch eventually converted a Bale cross to make it two, before Roman Pavlyuchenko tapped in an 89th-minute cross to secure three points. If nobody knew Bale back then, his two performances put him on the radar of big clubs around the world. Too few were aware of his goal-scoring talents prior to this performance but it fuelled his rise to the top. Champions League nights are the platform to make your name; Bale might have underwhelmed in the league up to then but it all changed dramatically with his Milan frenzy. Both Bale and Tottenham have come a long way since that starry night in Milan, with expectations around them having vastly evolved. The Welshman is now Real Madrid’s biggest name, and Tottenham grapple with heightened ambitions. But no one will ever forget the game that established both as a force to be reckoned.